Foosball tables are a lot of fun for people of all ages, but the full size ones take up a lot of space. 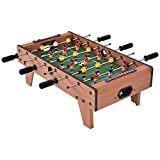 So, if you live in a small apartment or condo, or just don’t want one of the full-size tables taking up a whole room, then a mini foosball table is a good value for the money. They come in a variety of sizes and are the perfect to enjoy the game when you don’t have a lot of space in your home. Mini foosball tables are basically just smaller versions that do not have legs. Instead, they are designed to be tabletop foosball tables. So, all you need is a kitchen table, counter top or other type of surface to sit the game on and you’re ready to play! Plus, the small size makes this type of small game easy to store when not in play. Another good thing about the mini foosball game is that is is a LOT cheaper than a full size model. In fact, some models on the market are under $50! 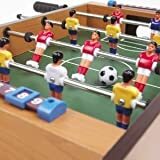 That low price and small size makes mini foosball tables a good choice for kids. 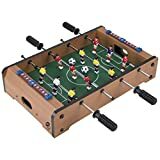 The only bad thing about mini foosball tables is that they do not have the same type of high quality build that you get from the larger size tables. And, as can be expected, some brands and models are better made than others. If you want to buy the top rated tabletop game that gets you the best quality for the money, then I suggest you check out the GoGlory Deluxe Soccer Table model. It is one of the best selling tables each month at Wayfair, and for good reason – it offers unsurpassed quality for this type of table. One of the things that I really like about this one is that it looks very sleek and sophisticated. Even if you’re shopping for something for your kids, this will look great sitting out in your home. It almost has a bit of a luxury design to it. Though it might look large in the image, this is definitely a small tabletop model. It is a 38-inch model, with the width at about 20 inches. And it sits about 12 inches high. Proving that this one is made from high quality components, it weighs in at 33 pounds. So, if it is for kids, you will probably need to help them set it up and remove it from the table for playing. Another great feature of this one is that the rods are actually chrome-plated steel, which means you don’t have to worry about them getting bent during play. And the handles have a black rubber grip, just like all the good full-size models. You do have to put it together when it arrives and that takes about two hours. Fortunately, the instructions are included and everything is numbered, so it is not that hard to do on your own. It just takes a bit longer than I would have liked. At the end of the day, this is a really solid table that should give you plenty of years of play. It is a lot of fun, and while it doesn’t give you the same feel as playing on a tourney table, it is still a great little game for people with limited space or who need a good tabletop foosball game for kids. If you really like the look of the GoGlory Deluxe model above, but need something a bit smaller then check out the Shift3 Black Series Table Top model. It is ranked just as highly by us, but the actual game is smaller in size. With this one, the width is just 20 inches and it’s only around 22 inches in length, which is a considerable difference compared to the GoGlory model reviewed above. And it is still just as nice and high quality. This one is also made from real wood that this sturdy, metal and laminate. The handles have a large rubber grip, that makes it easy to play a fast-paced game. And the built-in sliding score keepers makes knowing who is winning pretty simple. Since it does come with three balls, it is not recommended for children under age 12, however if you are a responsible parent who can supervise younger children who are playing, then this will be a good tabletop gaming option for them. A small amount of assembly is required, but it shouldn’t take you too long and directions are included. Overall, this is a pretty robust little gaming table that is made from quality components that should give you plenty of years of playing time. For a high quality option with a size that is in between the two models listed above, we suggest that you consider the MD Sports 24″ Tabletop Soccer Game. This model has the same high rating as the GoGlory and Shift3 models above, but the size is different. With this one, you get a game table that is 24 inches in length and about 14 inches across. So, if this size is better for your space, definitely jump on this one while it has such a great low price. It is cheaper than the two models listed above at Wayfair, but that is mostly due to the fact that that materials are a bit cheaper in quality. This game is made up of steel rods, plastic and MDF (instead of real wood). The handle grippers are made of rubber, so quick game play is easy to do without getting a hand cramp or calluses. If you look at the exterior of this one, you’ll notice that it doesn’t have the same sleek design as the other two models listed above. Instead, you have a design on the sides that makes it better suited for kids and teens. This table is very lightweight at less than 8 pounds total, which makes is very easy to transport and move around. Most kids can even move this one without any help from adults. And like the models listed above, you get the sliding score keepers so that you’ll always know who is winning your epic game showdown. Overall, this is a quality tabletop game but it is definitely not as good as the other two models listed above. However, the price on this one is cheaper, so that alone might make it a better choice for some families. 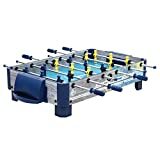 If you are shopping for a good tabletop foosball game for kids, then you should take a look at the Sport Squad FX40 Foosball Table. It is a favorite among kids and teens. And it just happens to be a good quality gaming table, so it offers a good value for the money. 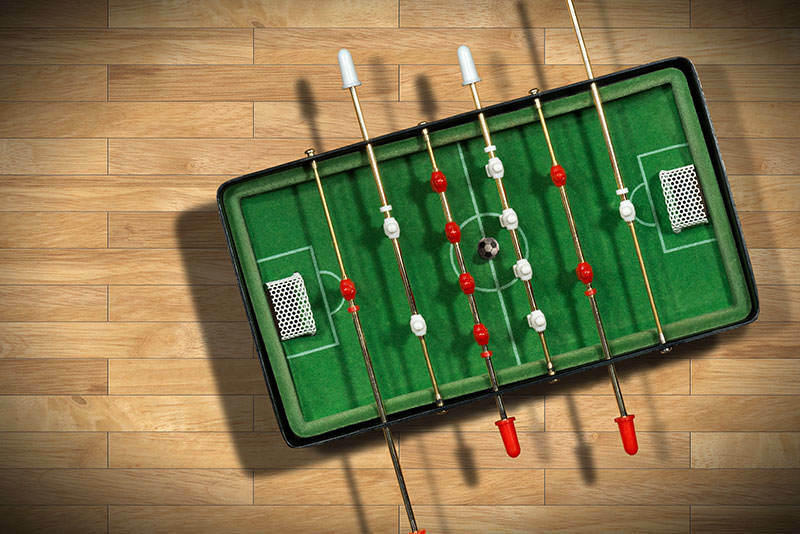 This mini foosball tabletop game is one of the longest models with a 40-inch length on it. The width is around 20 inches and it sits about 8 inches high once you put it on the flat surface for playing. Most of the components are very high quality. You’ve got chrome plated steel rods with ergonomic handles that have black rubber on them for easy gripping during fast game play. The playing surface is made from MDF. And if you’re concerned about it leaving any marks on your tabletop, don’t worry – it has rubber pads on the bottom of the legs to make sure that does not happen. Like the other tables, you got the sliding score keeping system so that you always know which team is ahead. And, you’ll like the 3-man goalie, which helps you make those tricky corner shots. Assembly does not take all that long, maybe a half hour to 45 minutes tops. It’s hard to find a better value for the money on the market right now. If you want something under $50, then this is the best that you’re going to get. Buying it at Wayfair gets you a discount that makes it pretty darn close to that fifty bucks. Of course, you do need to remember that the playing surface is MDF particle board and not real wood like the GoGlory model above. As long as you’re okay with that, then you will love playing on this one. Another great option if you want a table with a fun design as opposed to a sleek and luxury look is this MLS Kick-Off Tabletop Soccer Table by Harvil. Honestly, I like this one a lot better than the MD Sports and Sport Squad models listed above. It has a fun design that appeals to teens and kids, but you still get a nice quality mini game table. The size of this one is 38-inches in length and 20 inches in width. Once on a flat surface you’re look at a height of around 9-inches. And since it’s not made of real wood, it weighs in at about 19 pounds. The steel rods are chrome plated and feature rubber grips on the handles for quick play. The type of wood used is thick CARB certified wood (which is still some type of particleboard). And the legs have furniture protection pads on the bottoms so it doesn’t scratch any surfaces. You get the 3-goalie configuration with this one, which makes for better game play. And you get to keep score with the sliding score tally parts. Overall, this one looks great and if you’re okay with it not being real wood, then it is a great buy. It is affordable and has a fun MLS soccer branding design. Kids love it and so will you. 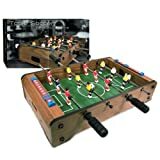 As you compare all the top mini foosball tables above, you will notice that most of them are made out of MDF or particleboard instead of real wood. And, the real wood models have higher price tags. That is because real wood is higher quality than particleboard or MDF. In fact, with the particleboard and MDF models, you have to be careful when putting it together because you can very easily split the wood. This problem does not happen with the models that use real wood. So, before you decide on one of the cheaper models, consider spending a little more for one of the higher quality models that uses real wood. You’ll end up with a gaming table that will last you for much longer that way.